Description for this Autocad block : Autocad drawing of The Smith House section A-A, a longitudinal section from south elevation view, the Smith house was planned starting in 1965 and completed in 1967 in Darien, Connecticut. 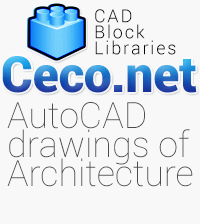 These autocad blocks are in dwg and dxf format, free Download. Is a work of modern architecture designed by the architect Richard Meier.